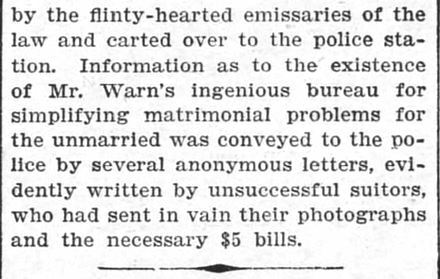 Matrimonial Bureau run by a man named Chinn, accused of having purchased pictures of Actors and Actresses and passing them off as candidates for marriage. 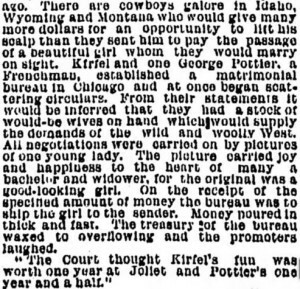 In an article reported in World, New York, New York, on 22 July, 1893 (Saturday), page 6, a man named Kirfel used that single photograph of a lovely young woman to entice “cowboys galore” into parting with hard-earned money. A transcript of a paragraph contained within that article follows (along with the difficult-to-read newspaper clipping). Stock Photos sent by Chinn’s Matrimonial Agency Part 2. Header Image. 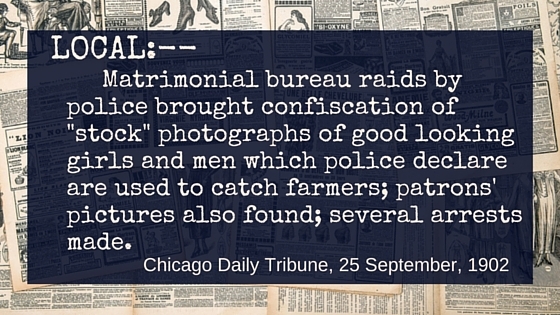 St. Louis Post-Dispatch 30 October, 1902. 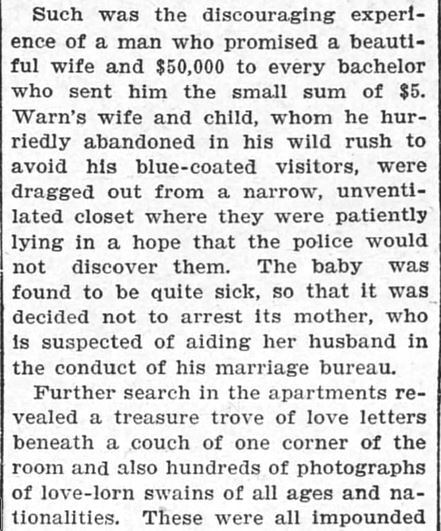 The following is a transcription of the article, with all spellings precisely as they appear in the 1902 newspaper scanned image. Words like “Postoffice”, while incorrect in 2016, are historically accurate and ‘correct’ for 1902. …..“How to be wealthy though married is the problem which thousands of single men and women throughout the country have been trying to solve during the past three weeks, in placing themselves on file in the “suite” of the Verona book Co. and Introduction Bureau at 204 North Third street. 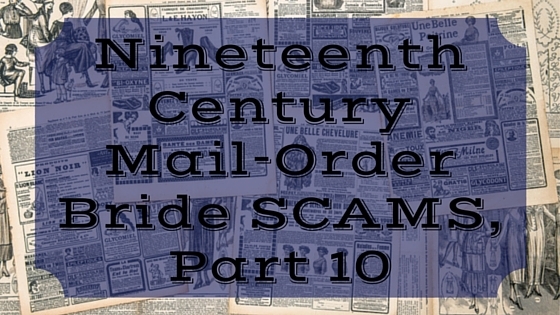 …..This institution until yesterday was managed by a man calling himself W. W. Chinn, who was arrested by Postoffice Inspectors M. G. Price and J. D. Sullivan, and is held to answer to a charge of using the United States mails to defraud. …..In Chinn’s office were found sets of circular letters which he mailed, with the aid of four girls in his employ, to those who replied to the advertisements. 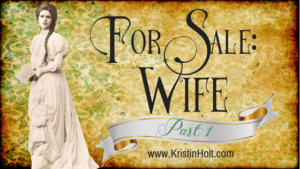 There was one circular letter to women seeking wealthy husbands and another to men seeking rich wives. …..In the circulars a “suitable life companion” is glowingly described, “worth at least $79,000,” and the applicant is told that he may become a member of the “Introduction bureau” for $5, the fee in every case to be paid before the identity of the prospective life partner is divulged. To women the fee was $2. ….The postoffice inspectors found more than 200 letters in the morning mail delivery yesterday, addressed to the Chinn institution, many of them containing the fees. The young woman who served as stenographer to Chinn said that the receipts of the office since it was established in St. Louis have been from $85 to $110 daily. …..Here is a sample answer to the advertisement of “Mr. Chinn,” reproduced above. It is from a young woman at Greeley, Colo.
…..“I am all you desire in womankind, and am in need of a kind husband, who is willing to take care of and support a good wife. I am not good-looking, nor so homely that a man is ashamed of me, but I believe in pretty is as pretty does. Stock Photos sent by Chinn’s Matrimonial Agency. Header Image. 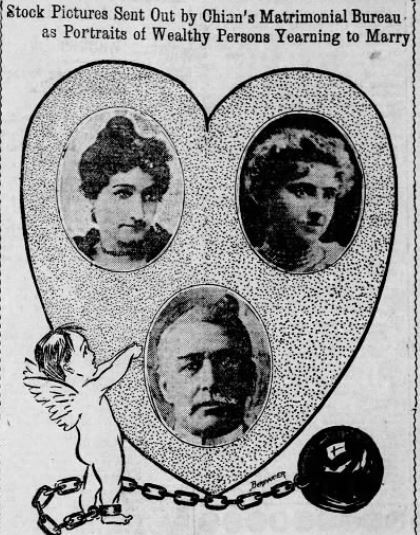 St. Louis Post-Dispatch 30 October, 1902. …..It is charged by Mr. (Inspector) Dice that Chinn came to St. Louis from Chicago three weeks ago and that he was forced to leave Chicago because of the recent raids made on matrimonial agencies by the police. 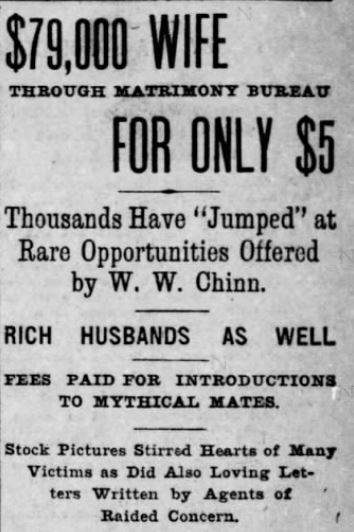 W.W. Chinn advertisement. St. Louis Post-Dispatch. St. Louis, Missouri. 15 February 1903. Just how frustrated must lawmen have been, then and now, when those who obviously abuse the trust of law-abiding citizens, skirt the edges of the law if not trample all over it, for monetary gain? 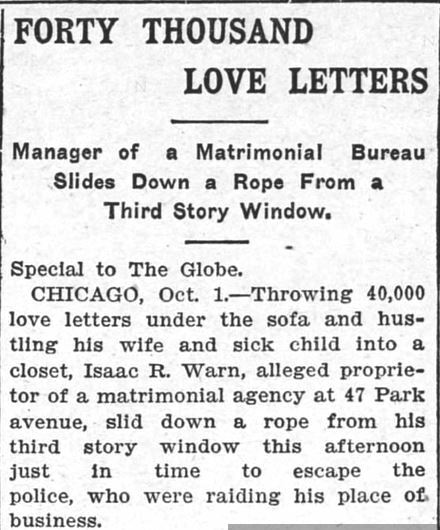 40 Thousand Love Letters. Part 1. The Saint Paul Globe, 2 October, 1902. 40 Thousand Love Letters. Part 2. The Saint Paul Globe, 2 October, 1902. 40 Thousand Love Letters. Part 3. The Saint Paul Globe, 2 October, 1902. And what if the Salvation Army entered the Cupid Business? 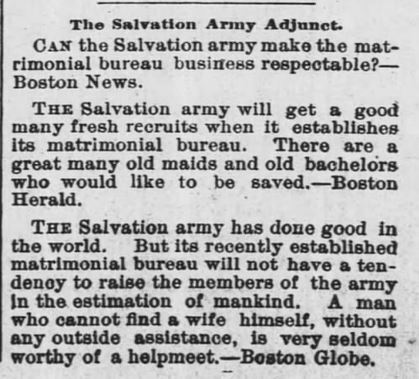 Salvation Army opens matrimonial bureau. The Monroeville Breeze. Monroeville, Indiana. 28 April, 1892. Up Next! 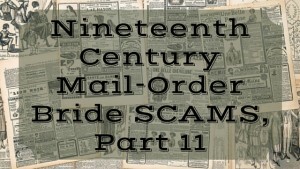 Nineteenth Century Mail-Order Bride SCAMS, Part 11, with a series of newspaper articles that detail the arrests, acquittals, alleged bribery, multiple mail-order businesses, alleged income, and probable two-decade reign of fraudulent terror by one Charles H. Rowan of Milwaukee.